Kubernetes is developing many of the facilities for an abstraction like workspaces. Logical isolation of clusters of process containers. Service proxies to distinguish between interior and exterior promises. Self-repairing desired-end-state semantics, with replication controllers. It's main drawback, presently, is that it is designed as a top-down management system, rather than a bottom-up cooperative. The logical picture might not reflect the physical picture. Particularly, the use of TLS certificates as the basis for identity (and CAs = TTPs) is a serious source complexity. Bottom-up name management of service points (interior and exterior). Dissociation with IPv4-based server semantics. Policy based management of service nexus (complex interconnectivity of microservices). Knowledge-oriented desired end-state workflow (DSL model). The ability to incorporate the modelling of device resources, and network capacity into service estimates. Define new clusters/workspaces without changing the hardware. Subsets and private tenancies are managed using namespaces walk-through and namespace sharing. Add or remove specialized hardware into only certain clusters/workspaces -- analogous to adding new remote cloud or bare metal instances to a resource cluster (Kubernetes node management: Labels on nodes can be used in conjunction with node selectors on pods to control scheduling, e.g. to constrain a Pod to only be eligible to run on a subset of the nodes; this is a top down decision. A node must also be able to say which pods it is willing to accept from which namespaces as a matter of policy). e.g. could a camera join a workspace cluster? Apply to join someone else's cluster as a member. As a user -- get account, based on client certificate (.cn=username), OpenID (email=username), etc. See Authenticating Across Clusters. User credentials must be mapped to a namespaces and workspaces on every member node. Workspace credentials work from an authorized source like an identity provider (OpenID) authentication. This is initiated by the first user. Resource providers (apps, storage services, virtual interfaces, etc) need to accept security perimeter promise/responsibilities from workspace managers. Kubernetes starts with a physical set of hardware and places a controller on top of it. 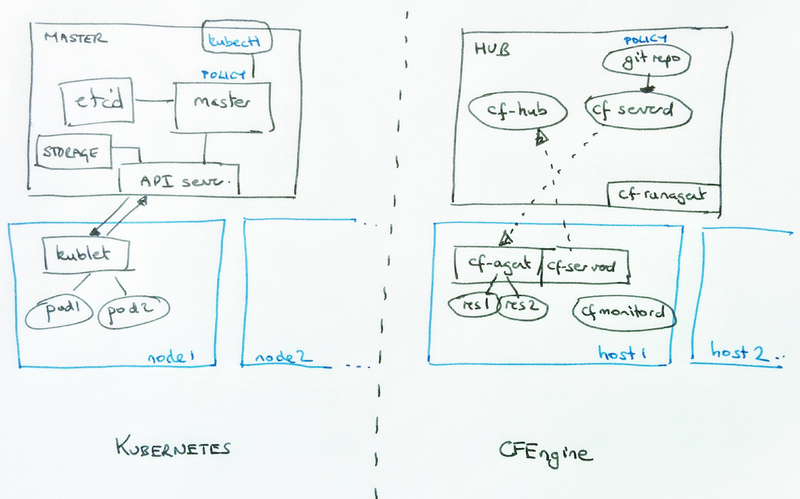 Comparing some of the features of Kubernetes with a promise-oriented bottom-up system like CFEngine. Kubernetes has remarkably many of the same features, but its priorities are reverse compared to CFEngine. CFEngine makes self-healing and autonomous, bottom-up behaviour priority, and makes sharing optional. Kubernetes makes clustering and top-down sharing a priority, and makes self-healing optional. implies no automatic connectivity, just logical association. Assumed top down. Centralized master architecture. Must be engineered through policy, and client-server exchanges. De-centralized peer architecture. No a priori shared community abstraction. Every service for itself. Speculative promise model, like "DSL"
"clusterIP": "10.0.171.239",     # conflicts with LoadBalancer??? "loadBalancer"                         ## ???? what is this?